Calibration standard lamps with 2π radiation distribution characteristics are preferred for calibration of integrating sphere systems with spectroradiometers used to measure LED based light sources and spot source lamps with a hemispherical light distribution. Using a 2π type emitter standard lamp, calibration is performed under similar sphere surface illumination conditions (including baffle and sample holder) as in the test sample measurement. 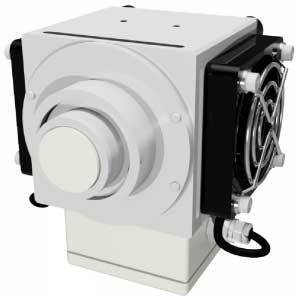 The BN-LHSF-2p-20 consists of a 100W quartz-halogen frosted lamp in a fan cooled housing (active air flow across lamp socket) that mounts directly onto UMPF-1.0-HL port frames plus adapters for larger port frames are available. Calibration and certification of the spectral radiant flux from 360-830 nm is provided. Lamp power supplies are also available. For product specifications for the BN-LHSF-2P-20 Calibration Standard Lamp, please visit the Gigahertz-Optik main website here.